Surrounded by lush rich Mediterranean plants and shrubs, with endemic plants and scented flowers, the Falkensteiner Resort Chia is just a few paces from the splendid half-moon beach of Su Portu, overlooked by the looming Spanish Tower of Chia. Cagliari Airport is just 60 km from the Hotel. When guests access the Falkensteiner Resort Chia they have the pleasant feeling of entering an ancient Sardinian hamlet set in a nature park. The hotel is perched on a hill, from which a series of paths lead down to the beaches and the park: its spectacular position offers splendid panoramic views over the sea and surrounding countryside. Children aged 12 and above are welcome in the hotel. They all have either balcony, patio or garden, AC, TV, minibar, free wi-fi, option of a double bed or separate singles, ensuite with shower (no tubs). There are also ten rooms set up for disabled guests, of the Comfort category, which are situated in the main building above reception, from which the lift is easily accessed, together with the pool and the restaurant. Accessible by means of a short walk or with the golf car along a well-marked path, the beach of Su Portu is marked by golden sands and an azure sea, and is just 350 m from the main body of the hotel. The first floor of the central area hosts the Open Air Fitness area and the Spa, available free of charge to adult guests, that may enjoy the wellness route including outdoor pools, sauna, Turkish bath and relaxation area. Massages and treatments are available on request (extra charge). From mid-June to mid-September, the Hotel offers a wide array of sports activities, available for a fee, including: a 5-a-side soccer pitch, two tennis courts, table tennis and water activities (kayak, scuba-diving, snorkeling, boat rental, SUP, wind-surf). Guests can enjoy the unspoilt nature and the outdoor areas with many activities, under the expert guidance of our activity staff. The Falkensteiner Resort Chia is also an excellent destination for golf buffs, since the Is Molas Golf Club is just 15 km away. The main restaurant (buffet) is set up pool-side has an area reserved for the kids. The pool also features the snack/cocktail bar. The Hotel offers the Half Board formula, which includes breakfast and buffet dinner. Beverages are not included. To allow guests to enjoy to the full the beauties offered by the island and in particular the area of Chia, set amidst fascinating pink flamingos and the splendid lagoon, the Hotel offers a series of trips outside the area. Included in the cost of your stay: pool, relaxation areas, vehicle parking, Wi-Fi in the rooms, sauna and steaming bath. Pets allowed upon request (€ 25,0 per day). Room with double bed or two singles, set on the first or second floors and accommodating two guests. Ensuite with shower; patio, balcony or garden. Garden view. Room with double bed or two singles, set on the first or second floors and accommodating two guests. Ensuite with shower; patio, balcony or garden. Side sea view. Room with double bed or two singles, set on the first or second floors, able to accommodate up to 3 guests. Ensuite with shower; patio, balcony or garden. Garden view. Room with double bed or two singles, set on the first or second floors, able to accommodate up to 3 guests. Ensuite with shower; patio, balcony or garden. Side sea view. 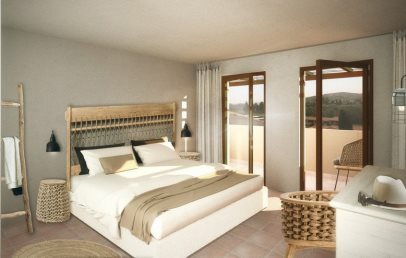 The family rooms have two bathrooms with shower and are able to accommodate up to 5 guests. Patio, balcony or garden.